Product and ordering information for EASYCAL Calibration Software: Simplify calibration to ISO 9001 & GLP standards; save test records in a database & generate reports. EASYCAL™ simplifies the tedious task of calibrating liquid handling, glass, and plastic volumetric instruments to ISO 9001 and GLP standards. Easy-to-follow procedures are outlined step-by-step and all calculations are performed automatically by the software. 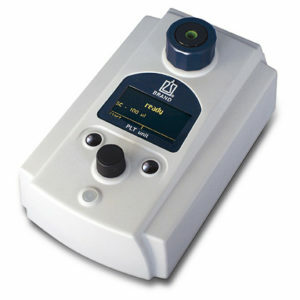 Test values may be entered manually into the software or imported directly from the balance via serial port. Reports are generated to document the calibration, and all test records can be saved in a database for subsequent use and tracking of instrument performance. An easy-to-read test record contains all data on one printable page. Using the special EASYCAL™ testing tubes, the calibration of pipettes below 50µL is much easier and more cost-effective than moisture traps or costly two-scale balances. *EASYCAL™ 4.0 supports many balances from A&D, Denver, Kern Ohaus, Precisa, Sartorius, Scaltec, and YMC. Please contact your balance manufacturer for the appropriate interface cable. 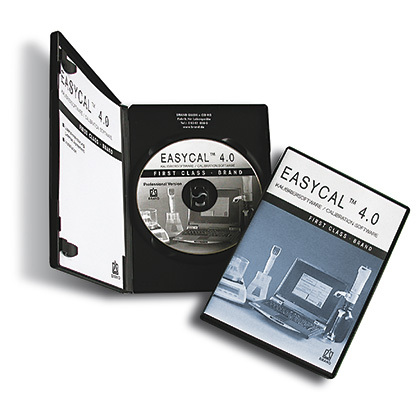 EASYCAL™ calibration software is supplied with: one CD-ROM (English, French, German, Portuguese and Spanish), installation instructions, operating manual. CD-ROM also contains SOP's for Titrette®, HandyStep® electronic, Dispensette®, Transferpettor™, and all Transferpette® models from BRAND, as well as BLAUBRAND glassware. System requirements: PC with 32 MB RAM, Microsoft® Windows® 98/NT with SP6/ME/2000/XP, SVGA graphics card with 256 colors, mouse, CD-ROM drive, and Microsoft® Paint. Can my computer run EASYCAL™? My balance has an RS232 port. Do I need to transcribe the results of my weighings? To ensure accurate transcription of data from balance to computer, we recommend purchasing an RS232 connection cable from your balance manufacturer. What is the function of the EASYCAL™ tubes? The function of these capillary tubes is to reduce evaporation of dispensed liquid of small volume pipettes. ⚠ WARNING – These products can expose you to chemicals including Carbon black (airborne, unbound particles of respirable size), which is known to the State of California to cause cancer, Di-n-butyl Phthalate (DBP), which is known to the State of California to cause birth defects or other reproductive harm, Lead and Lead Compounds, which are known to the State of California to cause cancer and birth defects or other reproductive harm, and Perfluorooctanoic Acid (PFOA), which is known to the State of California to cause birth defects or other reproductive harm.